For more information on the Rolex Explorer II, please visit www.rolex.com/explorer-ii/m216570. Stunning. I would wear this watch any time. Like to know how old the watch was when you bought it? I abslutely love my explorer II as is, white. But that said watches are like cigars and single malt it comes down to individual taste, if you take a hit when you decide to move it, so be it, but I say enjoy it! I like it. Not a fan of Rolex period…but your watch at least has some personality. Merci. Guillaume! I personally wouldn’t pay the big premiums these guys modifying the watches ask. A Ref. 1655 would look amazing, though. If you had a bride you would ask her to change her hair color. You would repainted your brand new auto. And you might even trade babies with someone else for the gender you really wanted. Amazingly you did notice the gentleman and his watch. Note he did not put aftermarket things to,it. I guess that’s why my wife left me…. I would prefer no date and a yellow crown logo. Rolex needs more colors in their dials. The new Explorer they just presented is pretty colorful with yellow and green on the dial. F***ing awful!!! Why oh why would anyone bastardise their watch in this way is beyond me. You f***ing idiot!!! Alistair, we expect a civilized tone here at Quill & Pad. I rather agree – though, as I am English, I shall just say that it is not quite my cup of tea. However, whatever-makes-one-tick! If you’re that upset over this, I think you need therapy. I do believe that there is a high likelihood he destroyed the resale value of this watch. However, it is unusual and a bold move. Time will tell if he made the right decision. Actually, all of the PVD can be removed but you are right, not sure of resale value if any. Say what you mean. Don’t sugar coat it ! Alistair, you shouldn’t take it so personally and take it easy, it’s just a watch. And I’m not an idiot: I love your name, my cat’s called Alistair. I caught what you did there.? I love the look! Having the orange hand pimped to the same colour of the bezel numerals as well might have made it marginally better! That would have looked really cool! I didn’t think of it. I’d love it with a matching green GMT hand. Yup, would have looked really cool. 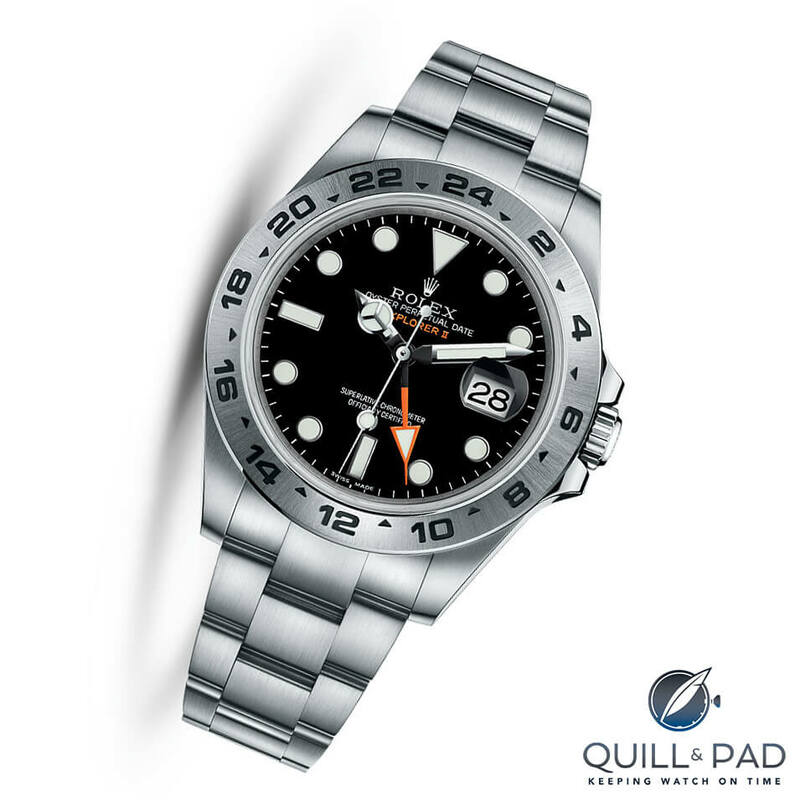 As a seasoned collector of watches, specifically of pre modern ROLEX, I get the attraction to the early 1675 references. 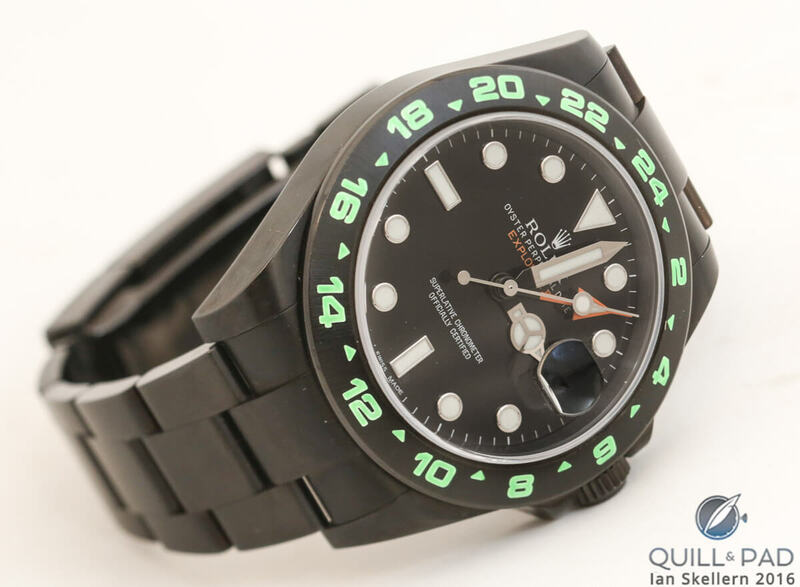 Though I “like” the 216570, it doesn’t really strike me enough to buy one. I say the same of modern 116610 and the much talked about new Daytonas. 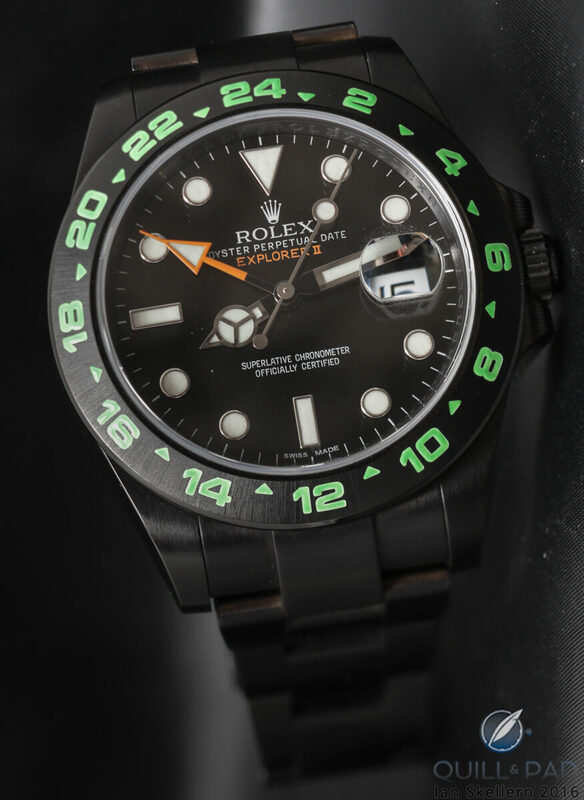 I think with modern Rolexes selling over a million a year, personalizing one is a good way to set it apart from the droves of like references you woul see out there. I would never do that to a 1675 or 6239, etc…. But think you did the watch some unique and personalized justice. Why be sheep after all? Enjoy it! Thanks, Gil, and we definitely share the love for pre-modern Rolex. I don’t like pvd moded watches generally. But I’ll hand it to you, with the luminous acid lime green, it really works. You’ve got an interesting and original looking watch, that’s a ‘fun’ wear. To be honest, I don’t know why you didn’t just buy the “Explorer 1”. Its a simple, easy watch to wear with same great heritage. It’s the one watch they make that can be worn comfortably low-key. ( As I’m sure you agree, rolexes are very Statement watches). Thanks. PS, yes it is fun to wear. I actually have some low-key Rolexes but they are all pre-1985. I’m sorry, but it’s dreadful. It’s not unlike something you might find hanging in a blister-pack. One day, I’m sure, you’ll see it in the same way. Expensive error, but I respect your adventurous spirit. Thanks for your straightforward comments, Alan. I keep wanting to like modern rolex’s but it just doesn’t happen and it’s no from me on pimping. Modern Rolex doesn’t do it for me either. I think it looks great. I love the contrast between the green bezel numbers and the orange hand. Wear it in good health. While I have “drunk the Kool Aid” of Swiss watches, Rolex has never been on my radar. Pimping that watch, IMHO, raised it from the realm of boring (1,000,000+ watches produced last year that all look alike) to something with a twist. Very nice. Enjoy with a clean conscience. It’s sinful. You took a Rolex and made it look a dimestore Timex Ironman. Yikes! Sounds like the story of my life. I think you should’ve just sold the Explorer 2 and then buy a replica for this modification. That is something I would NEVER do. A replica is more than a fake watch; it’s supporting mafia organizations and horrendous working conditions. You must really, really hate Rolex. Frankly I think pre-2000 Rolexes are some of the best watches in the world, and one of my watches with the most wrist time is in fact a Rolex Submariner 1680 from 1974. Not a huge fan of Rolex either, but I have 2; a pre-ceramic SD and a 18K Yacht Master. They are the best mass produced watches but with being mass produced I feel they inherently cannot be fine watches, the human touch also makes way for perfection and passion. Having said that, I think you’ve done a good job to make a Rolex your own with your personality. 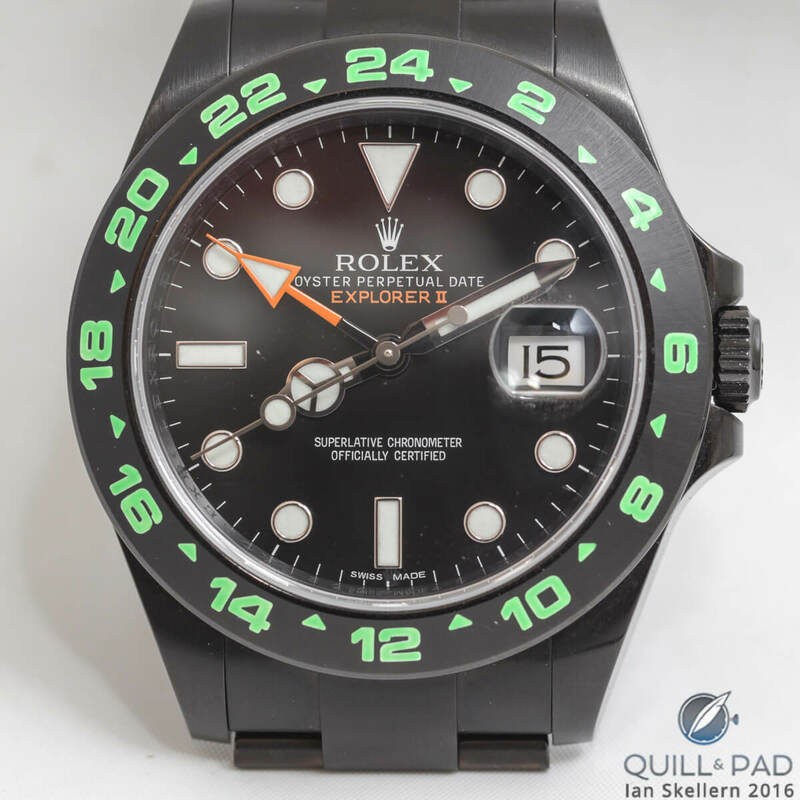 The down side is of course the watch will likely be “yours” for ever as you wouldn’t be able to resale it without taking a huge hit, also you may get push back if you ever wanted Rolex to service it. My guilty secret (rarely confessed to other watch guys) is that I do like a fun, pimped Rolex! I’ve had a blacked-out Sub in the past, and currently do own a Daytona customised to look like a PN (crownguard removal et al, and at a fraction of the auction price contrary to the statement in the article). To everyone who gets upset about pimping a Rolex – it’s only a watch, they are supposed to be fun and we are supposed to enjoy them!! I think what you’ve done is very much in the adventurous spirit of the Explorer. As a car guy I think of it as a retro-mod (new wheels, extra lights and a “murdered-out” paint job on a new Jeep. Looks great! (I also vote for a green GMT hand.). Now, go get some mud on it! Horrible! Yes, first picture is an official print that looks better than life but that makes it even more painful, isn’t it? I didn’t say I got it for free, the guy sent me the watch before I had paid for it. Can’t say I like the lime green, but this model in black looks great. I’m not one for bright and vibrant colors on watches, but the lime green at least has a luminova in the daylight feel to it. I wonder how it would look in this black with the original silver bezel to contrast. the contrasting bezel would have looked a killer! I don’t have a problem with the mod. It’s your watch and your money. Do what you like. I do have an issue with the fact that you seem to need approval from others. Be your own man! Wear your watch proudly, trust your tastes, and wear it in health. Cheers! My belief is that a watch can be a reflection of the person wearing it. Just like there are people who will buy a car and not make any changes to the the vehicle the entire time they own it and then there are others that will immediately start modifying the looks and/or performance of the machine. I think Rolex is like many companies and want to design a product that satisfies most of their clients, and then make evolutionary changes to the design over time. Then they come out with a special limited run to satisfy the smaller percentage of customers that want something different. You have taken the leap,even if you needed a little nudge. I think it is a really nice way to make the watch yours, and not that my opinion counts for much, it is a nice looking watch, and I would think it is great conversation starter. Enjoy “your” watch and many more. Love how you’re so honest about waiting for approval. Most free spirits are like that, but they’ll never admit it ! Onto the watch: your friend is right. It’s not a classic, and you chose well in deciding to mod it. The colour scheme is stunning, and turns an also-ran into a piece that will catch many an envious eye. Nice one, mate ! Watches are a matter of taste, aren’t they? There are countless watches I find horrendous; but many people will think otherwise. Rolex watches are just watches. Produced by the millions, kudos for not being a sheep and pimp it as you wanted. I do not like modern Rolex watches either and I find yours rather ugly to be honest. But again, this is not my watch and as long as you are happy, that’s what matters. I wouldn’t exactly say what you did was sacrilegious, but I’m curious, when you look at the Sistene Chapel, do you get the urge to grab a paint roller? Well, contrary to my watch, I don’t own the Sistine Chapel, nor was the ceiling of the Sistine Chapel replicated in hundreds of thousands examples (once again contrary to my watch). 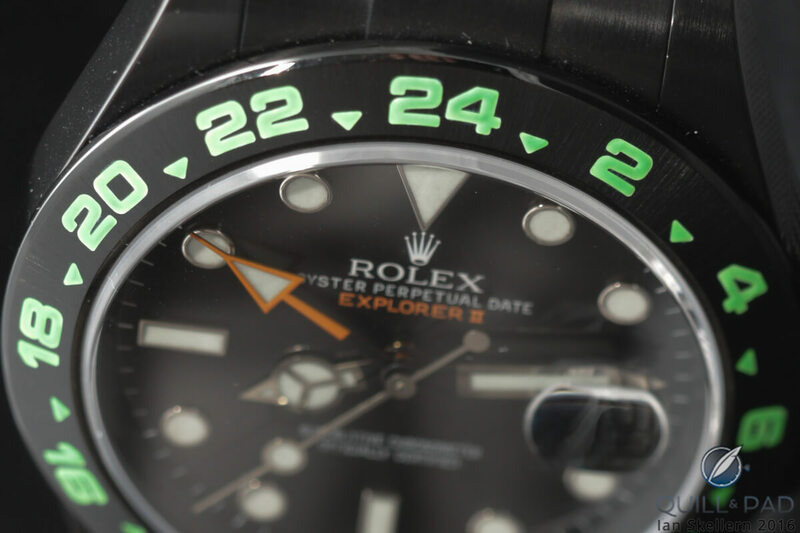 Nor is the Rolex Explorer II an irreplaceable work of art… I guess you’re getting the gist here. And finally I didn’t touch the dial so the day I want to go back to the original all I have to do is have the PVD taken off. Point taken. You are correct Sir! Is this a belated April Fool’s joke? I get “to each their own,” and by all means if you like it then wear it proudly (it’s not for me but that’s fine, and no need to seek validation from anyone else), but it is 2016. Please stop saying you’re “pimping” things. That’s high school and college dude-speak from 15 years ago. It erases any bit of credibility and comes across really unprofessionally. It’s a modified Rolex. Relax with the hyperbole. I guess I’m still stuck in the blessed period where MTV was actually showing music…ah, nostalgia! But point taken. You mod cars to make them faster, you mod bikes to make them lighter, you mod watches to make them…. NO, you don’t mod watches. At the end of the day… who really cares? If you like pimping your Rolex… pimp away! If you don’t… then, don’t! 🙂 Life is about enjoyment! Good on you! I love black watches…they take on a completely different look, one of stealth and covertness. Funnily enough I have been going through the same quandaries with an “aftermarket” look on a modern Rolex. It’s been great reading all the comments above, and each to their own, you can’t please all the people all the time! I don’t think your daft for doing it, after all there are loads of new and used Explorers on the market and it’s your money! 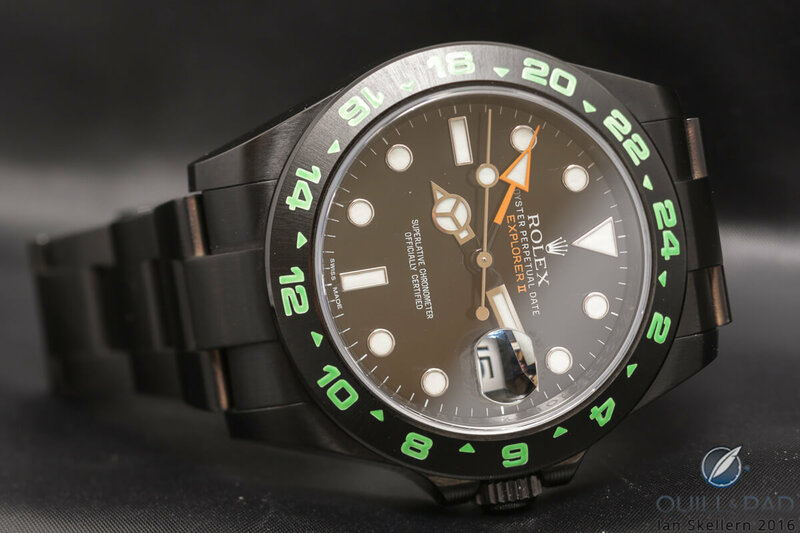 I’m intrigued by the green bezel, I would definitely have gone orange…in fact I might! Thanks, Simon, it’s funny having all these different and strong comments, I actually thought of orange numerals but was really set on green. Keep us posted and would love to see if you take the plunge. It now looks like a 1000BHT Bangkok copy. MAYBE orange would have worked but unlikely. I absolutely love what you did with it. Plus your photography is sharp as a tack. I think it is a bit stealthy and understated in black/lime. And you spent the money, so you are free to do whatever you want with it. It is interesting the price variations that you encountered. Definitely shows it pays to shop around. Thanks Larry. 🙂 I can only take credit for the watch, the photos are from Ian. My personal preference is the original. I really dislike the makeover; I think it is hideous, it might just be the green numbers on the bezel but not sure. I would never “pimp” out a watch, I will leave that to hip hop stars and basketball players. Thanks for your honest comments. Yep. The original model looks much better than its makeover. The blackened Explorer looks pretty cheap. I recently bought a polar Exp2, and this article has given me naughty thoughts about giving it a minor pimpin’ – I want to make a two toned bezel to make it look something like a (white dial!) 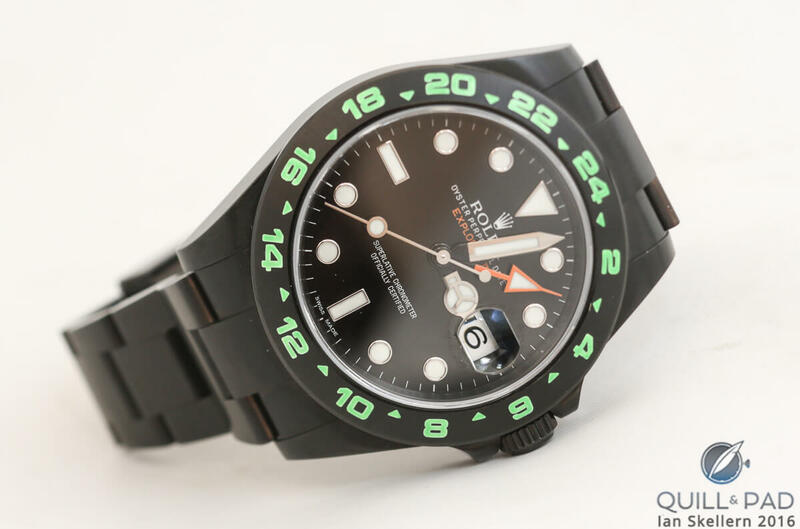 GMT x Exp 2. Any tips? Which colours would you go for? Option 1: Brushed SS with orange (lumed!) numerals top (night time), orange with black (lumed?) numerals bottom (day time). Option 3: Orange and Blue – they’re kind of complimentary colours…. Wonder what these would look like, happy to take opinions! I like the orange and blue idea! Or maybe we could do something more subtle by using the blue and orange only on the numerals/triangles on the bezel – and use a lumed paint, so it glows in the dark. Love it, please let me know who to contact to something similar done? Would love the contact details of the company who did it ? Great guts And a perfect Finish! I rehoused my dads agari chronograph in A1970 Case 50 Year Life Breitling ! Extended!